We arrange safe and fun river trips throughout Nepal. Whether you are a nervous beginner or an experienced thrill-seeker, we will ensure the adventure of your lifetime! Our Internationally experienced guides, skilled as boat captain, Chef, trained in CPR, first-aid and river rescue…all this give you an extra value exploring the remote countryside and natural beauty of Nepal, which is never possible without river trips. We can organize individual or group trips on a wide range of rivers by Raft, Kayak, double Catamaran or by special craft Bublick. We are running a popular kayak school for beginners and those who want to develop kayaking skills further, organizing river trips for kayakers and expeditions for expert kayakers and rafters on the upper section of Himalayan Rivers. It is our privilege to share the excitement of Nepal’s beautiful rivers. The most rewarding thing for us in our profession is to see our previous clients returning back to us becoming our great friends and they send their friends to us when they cannot come themselves! In the field of adventure activities such as whitewater rafting safety is a main issue. It’s essentially important that trips to be organized by people who themselves involved in the field, who do not work following blind idea and guess sitting in the office but who has real understanding based on the years of personal experience and involvement, who know all from inside out. Professionalism is a matter which everyone who is looking for whitewater trip and choosing company to go with should give very close consideration. Your trip experience and memories after it are tiredly connected with trip organizer. We love the wilderness of Nepal and wish to share it with all our clients and friends. We are committed to provide an exciting, fun and adventurous experience in an extremely safe environment. Through rafting and kayaking we offer you unforgettable experiences and hope to make your dreams come true. Our business philosophy is to be progressive; running new rivers, trying new things, catering for the special needs for our participants and working hard to provide the very best service possible. We at “WhiteWater Nepal Pvt. Ltd.” are happy to help our local communities by donating a percentage of our profits to the education and health of the children in eastern parts of Nepal. 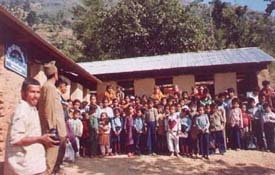 Since 1996 our company is regularly paying salary for a teacher of “Shree Shiva Shakti Primary School” Mechchhe-5 Kavre District which is about 90km. east of Kathmandu. This is a concept which we hope to expand throughout the country in near future. - WhiteWater Trip on Sun Kosi river (at the end of Monsoon Season) by Bublics. - You're welcome to join the trip! 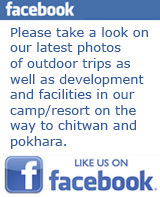 As always we will do our best for your adventure trip in Nepal with us!